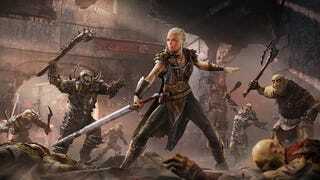 If you feel like adding some estrogen to your orc-slaying experience, today is your lucky day—Warner Bros. just launched a free new DLC pack (for PS4/Xbox One/PC) that will let you replace boring ol' Talion with a lady whose full title must be spelled out every time she's mentioned: Lithariel, the Warrior Commander of the Tribesmen of Nurn. It's just a skin, of course—you won't get any new abilities or actions, and it's likely that Talion will still be the main character for cut-scene and plot purposes. But this is still badass—who wouldn't want to go out and slay orcs as Lithariel, the Warrior Commander of the Tribesmen of Nurn? I wish more video games had free optional skins that let you totally transform your main character into a new skin of the opposite gender. I also wish more video games let you play as Lithariel, the Warrior Commander of the Tribesmen of Nurn.